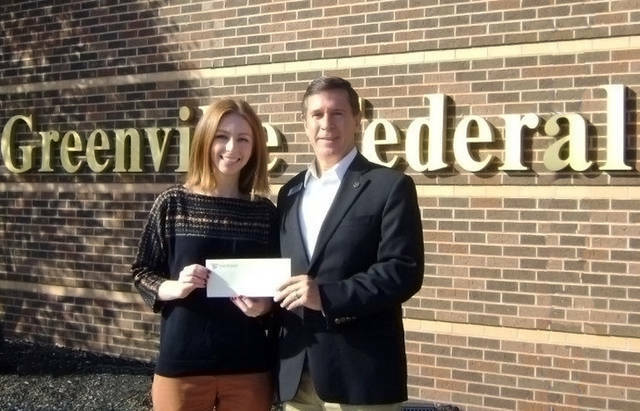 Jeff Kniese, president and CEO of Greenville Federal, presents the banks’ donation to Crysta Hutchinson Bloomingdale, executive director of Main Street Greenville. GREENVILLE – Main Street Greenville recognized Greenville Federal as one of the Platinum Sponsors for the upcoming 15th annual Hometown Holiday Horse Parade on Nov. 17. The 2018 Hometown Holiday Horse Parade will feature entertainment leading up to the grand parade, which will begin at 7 p.m. The lighted event includes 80-plus horse entries and brings an estimated 8,000-plus spectators into the downtown area. Main Street Greenville also thanked the many other local businesses who help to sponsor this annual event. A full list of sponsors can be found on its website. This year’s Platinum parade sponsors are Edison State Community College, Greenville Federal and Wayne HealthCare. “We are thankful for all of our sponsors’ support. Many are continued sponsors who help us create this event for our community each year,” said Peggy Schultz, board president for Main Street Greenville. Visit www.downtowngreenville.org or www.facebook.com/mainstreetgreenville for more information about Main Street Greenville and the 15th annual Hometown Holiday Horse Parade. Those who have any questions may contact Main Street Greenville at 937-548-4998 or info@mainstreetgreenville.org.